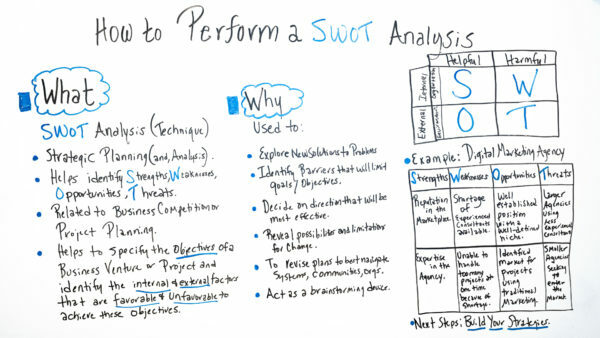 What is a SWOT analysis, and why is this powerful tool underused? Jennifer Bridges, shows you the what, why and how. Here’s a screenshot of the whiteboard for your reference. What is SWOT? It’s an analysis technique that is used in strategic planning and analysis. It helps to identify strengths, weaknesses, opportunities and threats, hence the acronym. It’s related to business competition or project planning and helps to specify the objectives of a business venture or project and identify the internal and external factors that are favorable and unfavorable to achieve those objectives. There are many reasons that the SWOT technique is used. It can help one to explore new solutions to a problem. SWOT identifies barriers that will limit goals and objectives. If you need to decide on a direction that would be more effective, SWOT can help you make that choice. It will also help to reveal possibilities and limitations for change. When thinking of revising plans, SWOT can be used to navigate systems, communities, organizations, etc. It’s also a great way to brainstorm. Jennifer explained how to use SWOT analysis with a matrix, with rows for internal organizational issues and external environmental ones, plus columns to collect what is helpful and harmful. As an example, she talked about a digital marketing agency. She then collected the company’s strengths, weaknesses, opportunities and threats—both internally and externally. The next step is to take this data and build a strategy based on it. With a clear picture of where you stand in context, which has been mapped out on the SWOT matrix, it is then possible to find a winning path through this landscape. Pro-Tip: Another application of SWOT is when you make a business case. SWOT can help you write a business case by collecting the pertinent information. Today, we’re talking about how to perform a SWOT analysis. But before we walk through how to perform one, I wanna talk about what one is and why it’s so important because I really do believe they’re so powerful and underutilized. So first of all, a SWOT analysis is a technique and it’s used for strategic planning and analysis. So it helps to identify the strengths, the weaknesses, opportunities, and threats, hence the SWOT. It’s related to business competition and project planning. And it helps to specify the objectives of a business venture or project, and to identify the internal and external factors that are favorable or unfavorable to achieve these objectives. So let’s talk about why this is so powerful to use. First of all, they can be used to explore new solutions to problems, to identify barriers that could limit the goals and objectives, help to decide on a direction that will be most effective. It also helps to reveal possibilities and limitations for change, to revise plans to best navigate systems, communication, or even organizations, and act as a brainstorming device. So sometimes you will see the SWOT identified in a matrix, a 2 x 2 matrix. So if the SWOT’s again, strengths, weaknesses, opportunities, and threats, we look at what’s helpful, what’s harmful. We also look at the internal which is representative of the organization, external, which is your environment. So let’s walk through an example. So one of my clients is a digital marketing agency and they were looking at competition where best to utilize their services and address some of the things that were creating barriers to their growth or to be able to scale. So some of their strengths were they had a reputation in the marketplace and they had expertise, high level of expertise in the agency. But the weaknesses were a shortage of experienced consultants available that they could hire when they want to scale. Another weakness was they’re unable to handle too many different projects at a time because of the shortage of resources that had the expertise. Some of the opportunities that were available to them is that they were well established, they had a well-established position with a well-defined niche so people came to them and that brought a lot of opportunities for growth for them. It also identified a market for projects using traditional marketing. So where they went to look at other opportunities for growth because the digital marketing had some limitations, they went back and added the traditional marketing, which there are more resources out there with the expertise. So if they scaled and grew that, those were available. Some of the threats were, there are a lot of larger agencies out there who use less experienced consultants. So they didn’t go for the high expertise. They went for the ones, maybe new into it, that they were training and teaching. And then another threat was there are more smaller agencies popping up all the time that were seeking to enter that market. So, as you can see, by identifying the strengths, the weaknesses, opportunities, and threats, it not only gives you means to plan and brainstorm growth, but it helps you in your next steps to really build out the strategies to avoid the limitations or avoid the threats and really leverage those opportunities. So you can see the power of a SWOT analysis. And if you need additional resources on a SWOT analysis, then sign up for our software now at ProjectManager.com.